Boxing passed away long ago. Agreed. Only purpose is to make the promoters money. Boxing and UFC. Both the stupidest "sports" on Earth, who's only purpose is to bash your opponents head in for no other reason other than to "win". The only thing they get out of it is Parkinson's. The REAL winner of this fight was...... Dana White. I was listening to Russ Anber on 1050 and he had the rounds scored 6-6. He was a ta boxing hall of fame function and nobody there was surprised at the result. 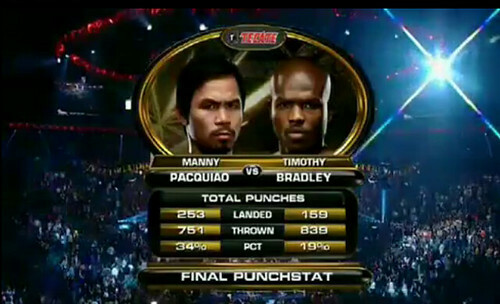 I'm a fan of Pac, but in round-by-round scoring, he didn't win. If I'm not mistaken (I know this is the case for the UFC) but boxing organizations have no control over the judging. The judging is done by an outside commision. I know UFC has had problems with judging because of the complexity of the sport some bad decision are made. I wonder what the issue was here. From what I am reading, this was a clear robbery. Was it just bad judging? Was it rigged? If it is rigged is the Nevada Commision a joke? In UFC I have only seen 2-3 really bad decision by judges. Never on main events though. All sports have risk to serious brain injuries. I would gather that Football/Hockey are more worrisome than MMA. Usually in the UFC is someone is taking a beating, they go to the ground and let the guy submit them. Also, fights are usually cut after a few knockouts due to health concerns. I think in terms of mental health the UFC is ahead of the NHL/NFL at the moment. 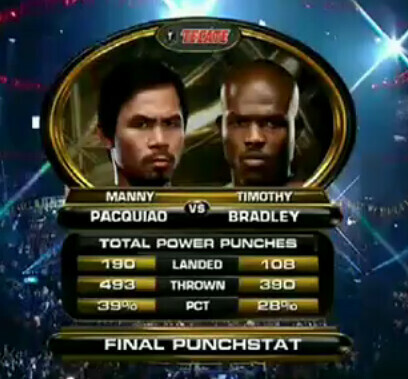 A five-judge panel assembled by the WBO championship committee unanimously favored Manny Pacquiao over Timothy Bradley in a video review of their fight.